Iran Museums: Fars Province (Shiraz), "Narenjestan Garden and Museum"
Narenjestan building, known as “Narenjestan Qavam” is a part of Qavam complex. It was designed and used as “Birouni” (a part of building to receive people out of the family circle). It was the domicile of Governor’s Court of Fars during Qajar period. It also includes Zinat-ol-molk house, designed and used as “Andarouni” (part of the home for only the close family). The other parts of the complex were: Private bath house, public bath house, Husseinieh (religious ceremonies building, detention house and stable. The detention house and stable no longer exist. 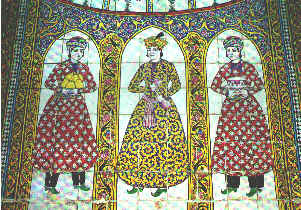 Narenjestan and Zinat-ol-molk buildings (Andarouni and Birouni) were connected via underground passage way. The complex is a significant representation of Iranian architecture during "Qajar" period. Narenjestan and Zinat-ol-molk buildings are examples of traditional Iranian residential architecture. This structure was built between 1879-1886 on the Northern side of the luxuriant "Narenjestan Garden" in Shiraz. Its construction is attributed to "Mirza Ebrahim Khan", the great grandson of the elder "Qavam" and grandfather of the contemporary "Qavamolmolk", with the assistant of a master mason. In 1965, Narenjestan was handed over to the staffs of Asian Institute and Shiraz University. One of its halls was being transformed into a museum later. It is necessary to mention, that Professor Arthur Upham Pope spent 50 years of his time life, working here, dedicating it numerous antique artifacts. Museum's collections of photographs and slides, initiated by Professor Pope, are also preserved here.